[164 Pages Report] The global genome editing market is projected to reach USD 6.28 Billion by 2022 from USD 3.19 Billion in 2017, at a CAGR of 14.5% during the forecast period. The key factors propelling the growth of this market are rising government funding and growth in the number of genomics projects, high prevalence of infectious diseases and cancer, technological advancements, increasing production of genetically modified crops, and growing application areas of genomics. Base year considered for the report is 2016 and the forecast period is 2017–2022. The prominent players in the global genome engineering market are Thermo Fisher Scientific (US), Merck (Germany), and Horizon Discovery Group (UK). The global genome engineering market is projected to reach USD 6.28 Billion by 2022 from USD 3.19 Billion in 2017, at a CAGR of 14.5%. The key factors propelling the growth of this market are rising government funding and growth in the number of genomics projects, high prevalence of infectious diseases and cancer, technological advancements, increasing production of genetically modified crops, and growing application areas of genomics. 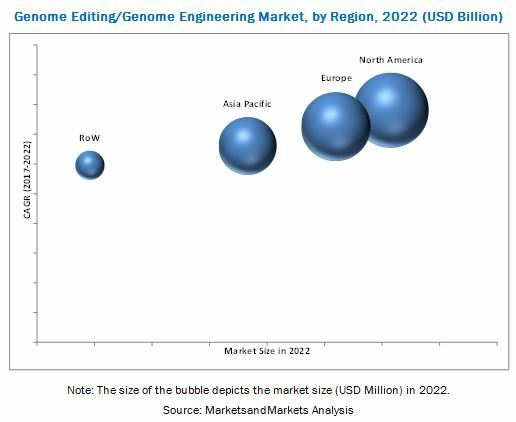 By technology, the genome engineering market is segmented into CRISPR, TALEN, ZFN, antisense, and other technologies (PiggyBac, Flp-In, Adenine Base Editor (ADE), and Jump-In). The CRISPR segment is expected to account for the largest share of the market in 2017. Owing to the factors such as the ease of use associated with the CRISPR technology and the ability of CRISPR to multiplex. 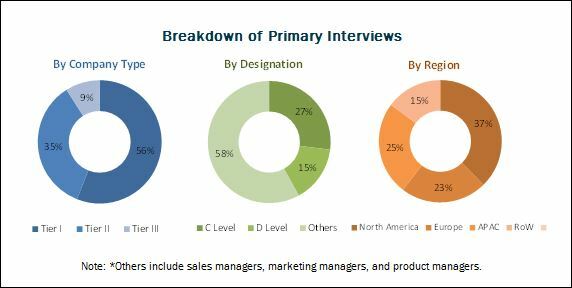 On the basis of application, the genome engineering market is segmented into cell line engineering, genetic engineering, and other applications (diagnostics and therapeutics). The cell line engineering segment is expected to account for the largest share of the market in 2017. Factors such as growing industry focus on stem cell research, increasing funding from governments and private organizations, and increasing global awareness about stem cell therapies are driving the growth of the segment. On the basis of end user, the global genome engineering market is segmented into pharmaceutical and biotechnology companies, academic & government research institutes, and contract research organizations. The pharmaceutical and biotechnology companies segment is estimated to account for the largest share of the global market in 2017. The increasing prevalence of infectious diseases and cancer are driving research activities worldwide; this is expected to drive the demand for genome editing in biotechnology & pharmaceutical companies. In 2017, North America is expected to account for the largest share of the genome engineering market, followed by Europe. Factors such as the development of gene therapy in the US, increasing use of genetically modified crops, rising prevalence of infectious diseases and cancer, and rising availability of research grants and funding are propelling market growth in North America. Factors such as dearth of skilled professionals and adverse public perception of genetic research are expected to limit the growth of the market to a certain extent. The prominent players include Thermo Fisher Scientific (US), Merck (Germany), Horizon Discovery Group (UK), GenScript (US), Sangamo BioSciences (US), Integrated DNA Technologies (US), Lonza Group (Switzerland), New England Biolabs (US), OriGene Technologies (US), Transposagen Biopharmaceuticals (US), Editas Medicine (US), and CRISPR Therapeutics (Switzerland).